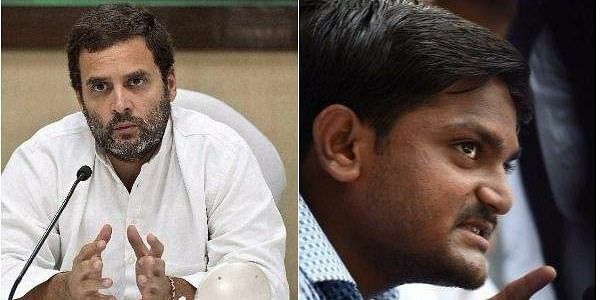 AHMEDABAD: The Gujarat Congress and the Hardik Patel led-Patidar Anamat Andolan Samiti (PAAS) today said that they have reached an agreement over the issue of granting reservation to Patels if the Congress is voted to power in the state Assembly election. The official announcement about the nitty-gritty of the reservation formula and the PAAS' stand on supporting the Congress during the Gujarat polls will be announced by Hardik Patel at a public gathering in Rajkot tomorrow, PAAS convener Dinesh Bambhania said after the crucial meeting on the issue. Hardik Patel was not present at the meeting. "I can say that we are in agreement with the Congress about their formula of granting reservation. We have not talked anything about giving tickets to PAAS. Hardik would announce tomorrow whether PAAS would support the Congress during the polls or not," he told reporters after the meeting. Hardik Patel had earlier set a condition that he would support the Congress in the Assembly polls, due next month, only if the party committed itself to allotting reservation in education and government jobs to his community.